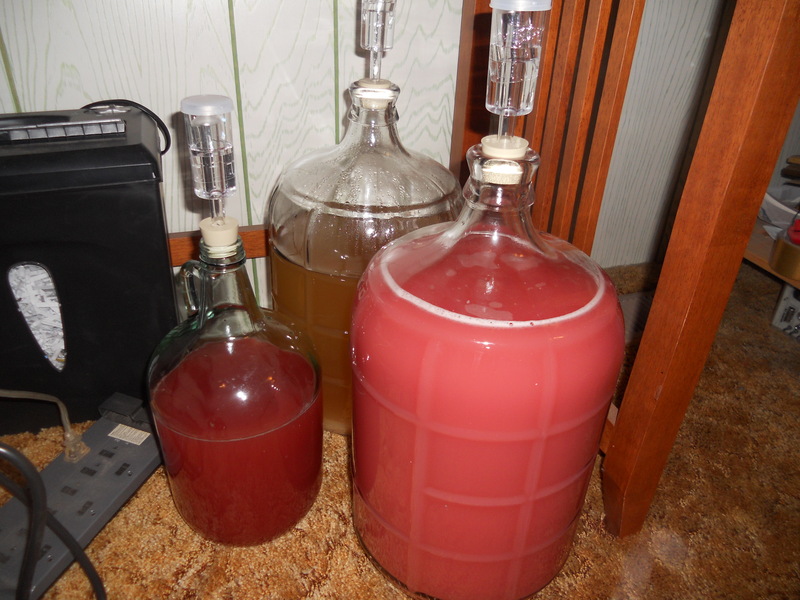 I have several fruit trees and time on my hands so this summer I started making wine. Then I became obsessed. One time I went to the brew store on a Monday to find it closed and I began to panic. I went back on Tuesday and got what I needed and there really was no need to panic. The problem was I only had one 3 gallon glass container and it was holding my pear wine that was going to need to sit for quite some time to clear up so I needed another container for another batch of wine. Now I have 3 gallons of pear, 3 gallons of plum, one gallon of plum via a more organic method, one gallon apple and 2 gallons concord grape. Oh, and just the other day I got one gallon of hard cider going. The hard cider isn’t from my apples but from a gallon of tasty organic Gravenstein apple juice. Otherwise, all the fruit is mine other than the concord grapes that came from a friend. I do hope to plant my own grapes when it is a good time to plant them. The bottles are fermenting all over the house. Those in the later stages are in the bedroom under the desk (including the pear wine indicated above) and those in the earlier stages are in the kitchen. I do plan to make a space in the basement for the later stage to occur so as not to take up all the extra space in the house with bottles of fermenting booze with a happy airlock hat. There will be more booze news to come as I attempt making other types of alcohol and bottling wine. It certainly won’t be boring.